To the north of the village you will find an ancient 11 Century Temple. I just talked to have been founded in 1022 Anno Domini. Though architecture is Indian the decorations are Balinese. The main gate looks like it was once whole but then was broken into two parts. Beyond it you will find a garden with many statues of deities scattered around. Inside you will find a three level Meru, which is a sort of Balinese Pagoda, and it is dedicated to the Trinity of Brahma, Vishnu and Shiva. The Padmasana building is where the islands’ one true Hindu God, the Sang Hyang Widhi, is worshipped. The temple is maintained by the villagers and is also owned by them. Donations in support of maintaining the temple is appreciated. The actual temple timings are from dawn to dusk. 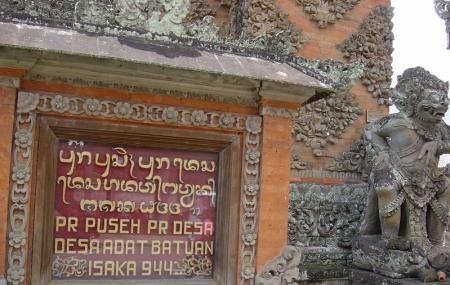 How popular is Puseh Batuan Temple? People normally club together Bali Zoo and Banjar Hot Springs while planning their visit to Puseh Batuan Temple. People also prefer to start their day with Puseh Batuan Temple. Definitely come here with a tour to explain everything here. Everything here has symbolic meaning and a religious history to it that should be understood to fully appreciate the temple. It is beautiful and very well kept. Divene place. Before entering the local people will give a apron like skirt to wear which is cool(I think). U can take pictures. A lot actually. Great atmosphere. It was our first stop and probably the nearest temple from Denpasaar. Great place to tour around and get a glimpse of Bali's rich artistic culture. Each masterpiece in the area was carved by skillful artists using a hammer and a chisel. Before entering, one has to wear a sarong. Locals offer a sarong (to be returned after) in exchange for a donation. Good and beautiful place. I highly recommend this place if you are on Bali.